Modern Balinese Pool & Landscape in Clifton - Land & Water Design, Inc. 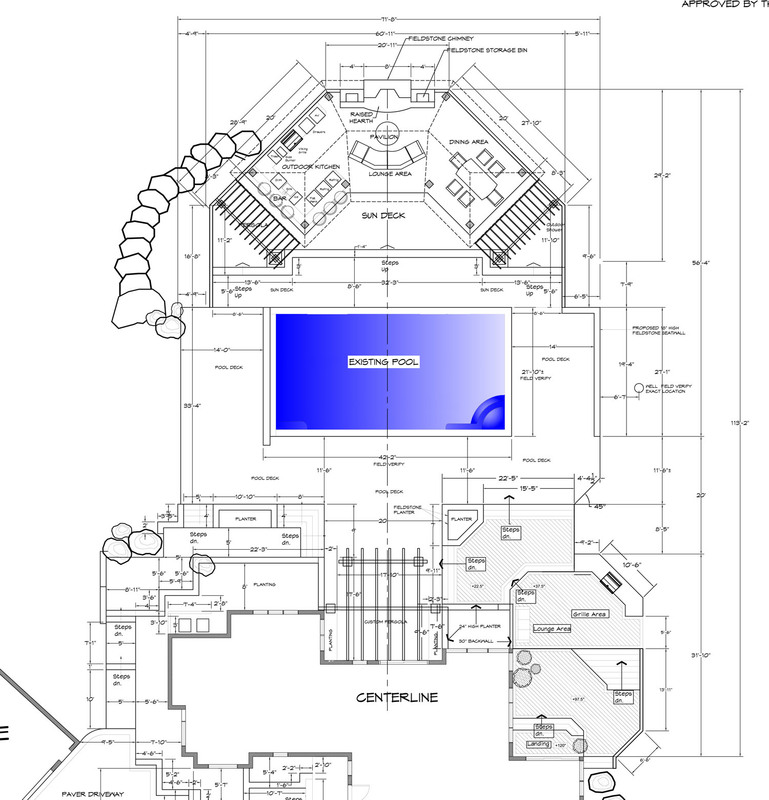 Sometimes the bulk of the inspiration for a project comes from the client’s passions. This richly detailed, unusual Clifton pool and landscape project is a perfect example. The clients had what could best be described as an entirely adequate backyard to start. The pool was functional, there was space for different functions, but nothing was exciting. 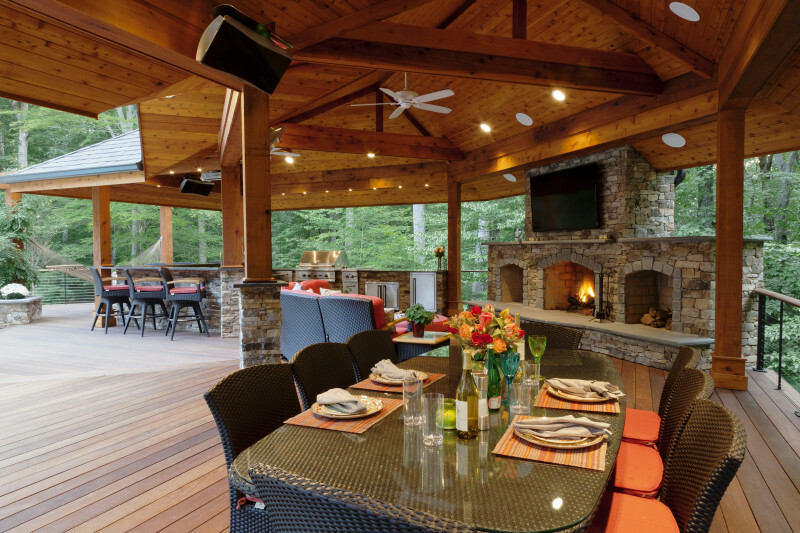 The client requested several items that are relatively common to Virginia landscape design projects: an outdoor kitchen, a fireplace and outdoor living room grouping, and plenty of space for an outdoor dining table. The client also had one very specific, a unique request: that the backyard evokes memories of his favorite travel destination: Bali. A Clifton, VA landscape design doesn’t typically lend itself particularly well to a Balinese theme. We are not known for tropical plants here in USDA hardiness zone 7 and material choices, if too exotic, can detract from the main house. 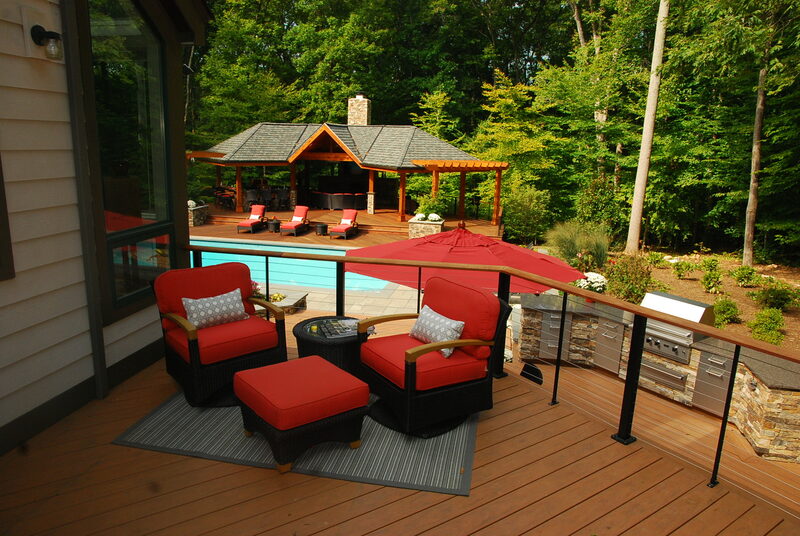 The pavilion was an opportunity to create a Balinese flair in a Virginia backyard. Because it is a large property with open woods behind the pool, we had space and scale to construct a 1,400 square foot pavilion centered on the back of the pool. This space allowed us to create a three-”roomed” open pavilion. The massive stone fireplace dominates the center portion of the pavilion with a generous hearth, firewood storage, and a flat panel television. To the right, the outdoor dining room opens to the woods below, thanks to the open, airy feel of steel cable railings. 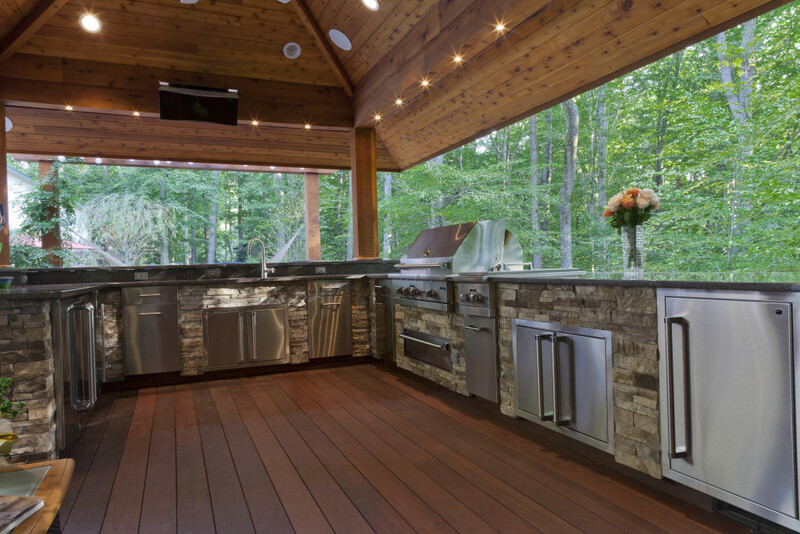 To the left is a fully appointed, gourmet outdoor kitchen. 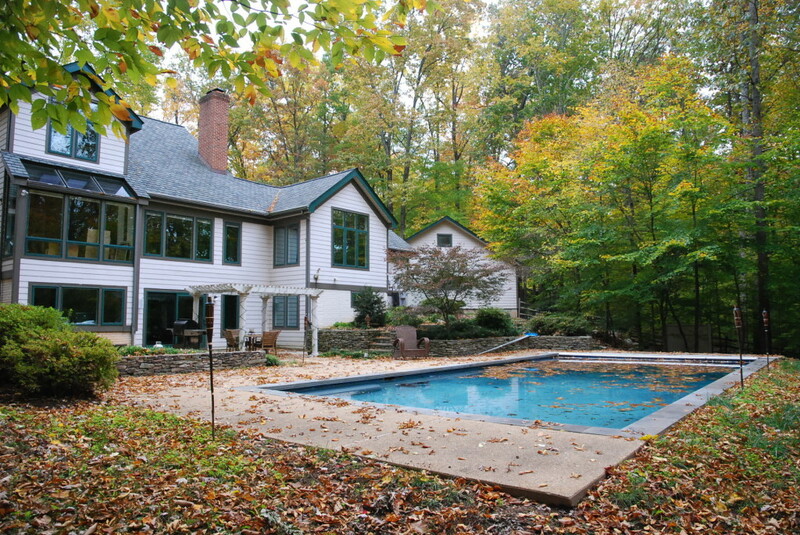 Not shown here, the pool equipment sits in a concealed enclosure under the pavilion. The pavilion’s low, sloping roofline, and angled footprint evoke images of Southeast Asia. To carry that point home we used copious amounts of wood on and in the pavilion as well. The floor is an ipe deck with a richly oiled finish, the posts wrapped in hardwood, and the vaulted ceilings are tongue and groove wood as well. 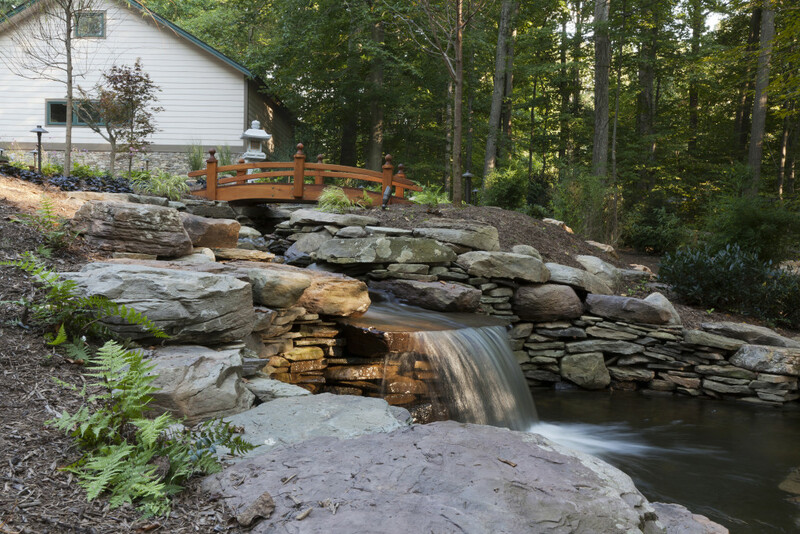 We unified the landscape by cladding the lower level of the house with the same stone used in the pavilion and combined the pool deck with flagstone and more ipe decking. We also built a new, larger pergola against the house and stained it to match the pavilion. The smaller outdoor kitchen closer to the house shares the same stone as the one under the pavilion roof. The landscape itself is simple yet elegant. The plantings are hardy enough to withstand the deer that plague any Clifton landscape design while adding a relaxed casual air to the space. A wood bridge arches over a rushing stream, part of a meditation garden through which the client enjoys strolling. With this project, we successfully blended Virginia and Bali, a feat of which we are truly proud. What’s your inspiration? Is it a favorite vacation spot or somewhere you’ve lived? Or are you simply inspired by the outdoor lifestyle you’ll create? Contact us today, and we’ll turn your inspiration into your family’s ultimate landscape.